Ask fellow campers about "Rustic Wagon RV Campground and Cabins" and nearby attractions. 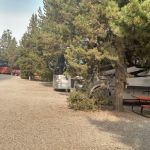 This park is conveniently located, far enough away from main street area and close to beautiful little town of West Yellowstone and west entrance of Yellowstone NP. Sites are very close in a large gravel lot and several trees need a little trimming. Owners were extremely nice and made several good recommendations for things to see and restaurants in the area. We camped in the site that Evil Kneivel liked to camp in. It doesn't really compare with another nearby campground, but is somewhat cheaper although a little over priced but you pay for location. Owner is very nice and really does care about their park. I would stay here again. We camped at Rustic Wagon RV Campground and Cabins in a Fifth Wheel. This was a great place to stay to access the West Entrance to Yellowstone. We could walk to restaurants and grocery store. The branches of the trees between the campsites hang a bit low and could use a bit of trimming. We would choose this campground again. We camped at Rustic Wagon RV Campground and Cabins in a Fifth Wheel. Very clean campground. Owner was informative and made suggestions on attractions and places to eat. We camped at Rustic Wagon RV Campground and Cabins in a Motorhome. Nicely located, far enough away from main street area. Quiet. Sites are very close in a large gravel lot. Owners were extremely nice and made several good recommendations for things to see and restaurants in the area. We had an AC issue and they were very helpful in assisting us to find repair tech. No dog walk area, but there is a forest service road starting less than a block away that is very nice for a walk. We camped at Rustic Wagon RV Campground and Cabins in a Motorhome. Quake Lake is a very interesting afternoon drive. This park is close to downtown . It is so clean,the showers,bathrooms and even the grounds, not even a piece of trash on the grounds. It's close to any place you want to soo in west yellowstone, including Old Faithful. We camped at Rustic Wagon RV Campground and Cabins in a Motorhome. The owners are most helpful, they provided places to eat, places to visit and gave info about the town .close to roads west to east and north. Very nice owners. Very close to west entrance of Yellowstone. Bathrooms extremely clean and accessible. Would stay there again. We camped at Rustic Wagon RV Campground and Cabins in a Motorhome. Very expensive for what you get, but this is, West Yellowstone, after all. The owner was most helpful and congenial, the facilities were all neat and impeccable, in terms of cleanliness. Small sites and you will be right next to your fellow camper. Patio tables for our site were perhaps 5' from the next motor home. We camped at Rustic Wagon RV Campground and Cabins in a Motorhome. This would be a straight 10 but for the price. I have a problem paying $50+ for any park, even in Yellowstone! However, it is in fact cheaper than some other parks in the area. We drove through just about every RV park in West Yellowstone and think this is the best park in the area. Wi-Fi is decent until park fills up. Fibre Optic should be online by Spring. Cable TV was available. We camped at Rustic Wagon RV Campground and Cabins in a Motorhome. If Ken checks you in suggest you pay attention and take notes on what he says! Everything he told us was on the money and VERY helpful! This is one of the cleanest parks we have ever stayed in. All the staff is super helpful and cheerful. Park is very quiet at night. Water is clear, sweet and soft. You will need a pressure regulator. This is our park of choice in West Yellowstone. This in one of the best parks we've ever stayed in. Not because of the park itself, which is older but because of the manager; he was superb. Excellent check-in and pull-thru site was easy to enter and exit. Bathrooms were spotless as was the laundry. Great wi-fi and cable TV. The manager made sure everything was top notch, the man was on top of everything. If we're ever back in the area, we'll definitely stay again. We camped at Rustic Wagon RV Campground and Cabins in a Travel Trailer. Bring groceries, if you shop in West Yellowstone you'll need to take out a loan. We felt that EVERYTHING in the town of West Yellowstone was way overpriced; don't appreciate getting ripped off, so we didn't participate in enriching greedy shop/restaurants/grocery store owners. We understand being a "tourist" town, but prices here verge on ridiculous. Sites are very close, but level and gravel. Park was always full. We camped at Rustic Wagon RV Campground and Cabins in a Fifth Wheel. Obviously a tourist town. Plan your trips into Yellowstone!! Love this place! It truly is the best RV park in town. Super clean and spaces are in the trees and at the end of town away from the crowds. We checked out other parks in town and were so glad we reserved here. Other parks were tight with many spots backed up to the busy roads. Rustic Wagon is has a fence around it and while the spaces have ample room between them with trees. The perfect base for exploring Yellowstone. Staff is helpful with lots of knowledge about the area. We will definitely stay here again! We camped at Rustic Wagon RV Campground and Cabins in a Fifth Wheel. If you need tips on things to do or places to eat just ask! They are a cash or check only business so plan ahead. I stayed here a few years ago. It was nice then and better now. It's changed management since then and nothing but improvements. A fairly small CG, but it has all the amenities. Manager was very helpful in getting my cable running. As an example as to how nice it is, I saw him raking the fir needles from individual sites, presumably to make the sites look nicer. WiFi worked fine. Spaces are somewhat short, but are wide enough and have vegetation between sites. It is quiet and only a mile from Yellowstone NP's west entrance. The only thing keeping me from a 10 is the fact they only take cash/checks. I'd definitely stay here again. We camped at Rustic Wagon RV Campground and Cabins in a Motorhome. The host is an absolute riot and his service was superior. Greeted me by my first name as I walked in the office door and asked how my traveling companion (by name) was. The value price for this area was outstanding. I had about 100 feet pull through for my Class A and tow car. Everything in the park worked although a little dated. We camped at Rustic Wagon RV Campground and Cabins in a Motorhome. Very clean park. Check in process was friendly and efficient. Easy in and out. All utilities worked just fine. Not a lot of grass for the dogs but it's right across the street from a wooded area that I let them run around in. Great little city. Wifi not that great but it works. Not many parks open this time of year. This one suits us fine. We camped at Rustic Wagon RV Campground and Cabins in a Fifth Wheel. Ernie's Bakery for coffee and awesome breakfast! Nice little park on the west side of town. It is about 2 miles to the west Yellowstone National Park gate. Sites are shaded, nestled in among pine trees. Sites are a little tight for units with slideouts, but they will fit. Sites are pretty close together. Each site had a patio and picnic table. Our pull through site wasn't long enough for our 37' trailer and truck, but you can park you pickup behind your rig. Wifi, cable tv, and all other utilities worked great. Park roads and sites are all graveled. The laundry facilities were great. We stayed 2 nights and all was quiet. They only take cash or checks. Management was friendly and very helpful. We would stay there again. We camped at Rustic Wagon RV Campground and Cabins in a Travel Trailer. If Ken checks you in suggest you pay attention and take notes on what he says! Everything he told us was on the money and VERY helpful! This is one of the cleanest parks we have ever stayed in. All the staff is super helpful and cheerful. Park is very quiet at night. Water is clear, sweet and soft. You will need a pressure regulator. This is our park of choice in West Yellowstone. Ernies for quick breakfast, and Buffalo Bar for Dirty Fries. Watch out for some gas stations selling cheaper gas, but at lower octane (85). Running Bear Pancake House good for breakfast. Serenity Bistro on Canyon st. very tasty. Best attraction in town is the Grizzly and Wolf center. Ernie's bakery and sandwich shop up the street on HWY 20 is a must. Good food. Nice pastry. You can get a lunch to go for your trip into the park. A to-go lunch includes sandwich of your choice, chips, apple, cookie and drink for $10.95. Are you affiliated with Rustic Wagon RV Campground and Cabins ?